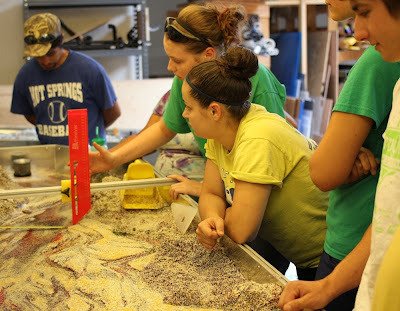 Riparian Rap: The joy in our job -- teaching with our models. The joy in our job -- teaching with our models. We’re in the business of building and selling river models. 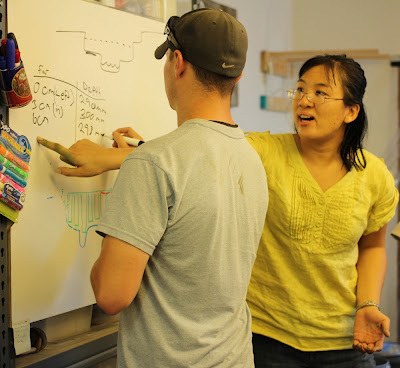 Day-to-day, we talk to clients, spend hours fine-tuning prototypes, crunch numbers, write instruction manuals, program Arduino boards for flow controllers, and pack and ship models to schools, laboratories and nonprofit groups around the world. But the best part, for all of us, is teaching with models. We get to see students interact with our models and with one another. We get to see them explore new ideas and test their own theories. Steve welcomed the newest cadre of SIUC’s NSF-funded IGERT program last week. IGERT combines elite doctoral students from several science and engineering disciplines to form unparalleled interdisciplinary research teams. At SIU, the group focuses on watershed management and policy, so the students who visited us are some of the best in our field, and we enjoyed the hours we spent with them in our lab. Members of the Youth Conservation Corps practice surveying in our Em3. High-school age members of the Southern Illinois chapter of the Youth Conservation Corps came to our shop, and Lily taught them basic surveying practices and the effects of building culverts and bridges. They were some of the brightest high school students we’ve encountered; after their lesson, we stepped back and watched them build a large and rather sophisticated bridge system in our Em3. And last Saturday, Keep Carbondale Beautiful, a local environmental education and community beautification nonprofit, celebrated its 25th anniversary. They asked us to join their celebration, so Lily, Nathan and Jim spent Saturday morning greeting visitors around an Em2 at the event.